rooftop solar Archives - Page 3 of 4 - Solar Love! It’s hard to know when you are a home owner or small company whether the benefits of rooftop solar power are worth the risk. Last December, SafetyWear, a small company in Fort Wayne, Indiana opted to install a rooftop solar system on its roof. Brian Steele, chief financial officer of SafetyWear, says the goal was to to install enough panels to produce more than enough electricity to meet the company’s needs. The company they hired to install the system was from San Diego, where the sun shines 68% of the time. In Fort Wayne, is it sunny just 59% of the time. “It’s hard to know when you’re a rookie” how well the system will work, Steele says. The plan was for SafetyWear to generate about 107% of its electricity needs from the system, which would allow it to bank a small amount of excess energy with the local utility company. In the past six months, the company has consumed 65 megawatts of electricity, but its solar-power system has generated 70 to 72 megawatts, meaning it has generated seven megawatts more electricity than it has used. Steele says the culture of his company is to conserve energy. He goes around turning off lights that aren’t being used. He even turns off the light in his office when he goes to lunch. During the day, the company opens the windows in the warehouse to let light in. He monitors the solar system closely and has learned a few things that surprised him. For instance, good days sometimes aren’t as productive as days that might not seem ideal. On a cloudy day, the system can generate more electricity than it can on a hazy day. Bright sunny days are not as productive as he thought they would be if it is very hot outside. The best days, Steele says, are when it is about 50 degrees outside. 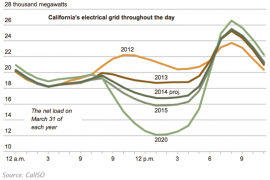 Solar energy is disrupting the electricity business. 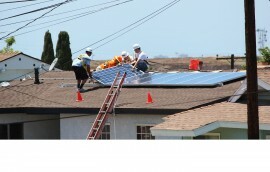 Utility companies say solar customers are not paying their fair share to help maintain the electrical grid and are imposing solar demand charges on customers with residential solar systems. That’s what the Salt River Project (SRP), a small utility in Arizona, did recently when it slapped new solar customers with a $50 a month fee on top of their regular electric bill. SolarCity, the nation’s largest installer of rooftop solar systems, is fighting back, claiming the solar demand charge is discriminatory, illegal, unconscionable and possibly immoral. Of course, that’s exactly what you would expect them to say, since saving people money on their electric bills is what makes their business successful. While that suit wends its way through that dark and scary place known as the legal system, some observers see a silver lining in all this and it has to do with what is known in the electric industry as “the duck’s head”. If you make a graph of how people use electricity during the day, it will start off in the morning at a certain level, then drop during the day when people are at work. But then, right around 5 pm, all those busy people race home, turn up the air conditioning, power up their electric stoves, turn on all the lights in the house and sit down in front of their computers and television sets until its time for bed. As a result, the demand for electricity from the grid goes through the roof, if you will pardon the expression, and electric companies have to be ready to meet the need. When you are done with your graph, it begins to look a little like a duck’s head during the evening hours and a duck’s belly during the middle of the day. The paradox for homeowners with rooftop solar systems is, those systems generate most of their electricity during the day when there is no one home to use it. When people get home at night, that is precisely when production from their home solar system is starting to fall off, so they have to buy the electricity they fed into the grid all day back from the grid when it is most expensive to do so. .
Why is that? Because now when folks get home from the office, they can draw electricity stored during the day from their home battery storage unit instead of from the grid. People with home batteries won’t have to pay high peak demand rates, which will boost their savings versus their non-solar powered neighbors. And that will convince more people to install rooftop solar systems in the first place. What can we learn from all this? Adding batteries to home solar systems is going to fundamentally change how we use power from the electrical grid. And that is going to up-end the traditional model for electricity generation and distribution. The more the utilities fight the spread of solar power, the more they are encouraging people to find alternatives to that model. The times they are a’changing, as Bob Dylan once said.